Fall is one of the most beautiful times of year. The leaves are changing colors, the weather is cooling down, and we can spend more time indoors without having to worry about fidgeting with the AC every few minutes. As a result, we’re often more likely to spend time inside reading a book or watching a movie than we are during the summer. For some, this is the best time of year to get their indoor cleaning projects done. 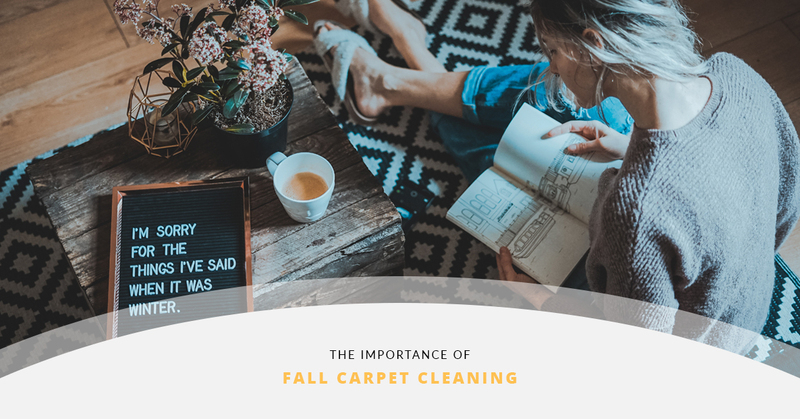 In this blog, we’re going to take a look at why fall is a great time to get your carpet cleaned. With the cooler temperatures, we’re also a lot more likely to spend time inside. Summer is oftentimes so hot, that we prefer to escape our homes early in the morning and not come back until later at night. Running the AC constantly can be costly and really crank up your monthly energy bill really fast. On the other hand, during the fall, the temperature is cool enough to maintain the perfect indoor atmosphere. Since you’ll be inside more, you’re going to need clean carpets to ensure you’re breathing fresh air the rest of the year. As much as we hate to admit, everyone has walked into their home only to realize they left a trail of leaves and mud behind them. There’s no denying it, when the trees change color and leaves begin to fall, it’s easy to get mesmerized by it and forget the havoc it wreaks on our homes. Putting a mat in front of your door is a good place to start, but we often forget to wipe or check the bottom of our feet everytime we come in the door. Getting your carpet professionally cleaned at the end of fall is a great way to ensure all the dirt brought in by those leaves doesn’t get rubbed into and damage your carpet, and that any stains are removed before winter. Let’s face it, nobody wants to have their carpets cleaned in the winter. Not only is it too cold to deal with any major indoor or outdoor projects around your home, but there’s a chance that you’ll end up tracking in mud or snow that will make the whole project a waste of time. It’s best to take care of any professional carpet cleaning before winter comes. When you need expert carpet cleaning care in your Vernon home, you can’t just call anyone. Buzz Brite is your top-rated janitorial company and can take care of any fall project you have in mind like carpet cleaning, tile and grout cleaning, floor waxing services, and post-construction cleanup. Give us a call today to learn more.